Elastic mary jane cross strap for comfort & fit. UPPER: Suede. Need it fast?. 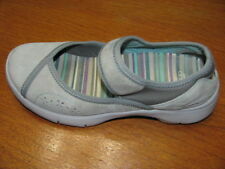 FLEXX comfort Mary Janes Gray/ Black with wide elastic across top, low wedge heel size 6M NEW. Shoes are in gently used condition. Dansko "Chrissy" black suede Mary Jane shoes. Elastic Mary Jane strap. Leather upper, Leather/Fabric lining, Rubber sole. Bottom soles are slightly dirty. Length: 11". Sides show light dirt. Insoles: 10.5". Very nice shoes. Uppers and soles have very light signs of wear. Condition is Pre-owned but amazing condition! Strobel construction and grooved outsoles provide great flexibility. Dansko Flats Purple Mary Jane Suede Leather Casual Walking Shoe Womens Size 6.5M This is a beautiful pair of women’s Dansko flats. The color is purple. The material is suede. The condition is excellent preowned. Smoke-free pet free environment. This item will ship within one business day of payment. The value is great. Thank you for your business and support of our small business. Suede is treated with Scotchgard™ for stain resistance. I have been. most pleasant buying experience possible. W O M E N ' S S H O E S.
Arleen Suede & Leather Slip-Ons. Take a step in a comfy direction. This slip-on shoe from Earth Origins intends to impress. Style: Arleen. EARTH ORIGINS. Leather upper; man-made balance. We do whatever it takes to ensure you have a positive experience - Consider us your partner in fashion! 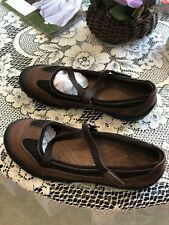 Lands End Mary Janes X strap style shoes Brown Suede with Darker brown leather trim. Very nice looking and comfortable. Great style and excellent condition. Good durable walking shoe. No wear shown, no scuffs or scratches (See Photos above). Need a good home and someone to wear them. In good condition with light wear to toes and soles. See photos for best description. ROCKPORT Criss Cross Leather Shoes • SUPER NICE QUALITY • WOMENS LEATHER CRISS-CROSS LOAFERS SHOES • With ELASTICIZED X BANDS FOR COMFORT! • WEDGE HEEL - APPROXIMATELY 1/2" - 1" • Women's Size • 10M • The Perfect Addition to Your Wardrobe! Very comfortable. Size is 7M, but this shoe runs big. These shoes are New in Box. Elastic Mary Jane strap. Leather upper, Leather lining, Rubber sole. Traction out sole. Dansko Mary Jane Flats. Suede Leather Uppers / Fabric Lining. Color: Black & Gray. Munro Mary Janes Flats Shoes Black Suede Fabric Size 8.5N. If you have a issue with your item I will resolve it! Don't like them?. Send them back! Removable insoles=yes. A sporty look. These shoes are in very good pre-owned condition. Removable insoles. Born W91238 Women Purple Suede Mary Jane Bow Flat Shoe Size 9.5 EUR 41 Pre Owned. Style w91238 size US 9.5 Condition is Pre-owned. Lightly worn, minor scuffs but in solid condition. See photos. Shipped with USPS Priority Mail. Poor Pre-Owned Condition: Previously worn apparel with significant visible flaw(s) and/or heavy wear/fade is in Poor condition. Worn Once Excellent Pre-Owned Condition: Excellent condition shoes have been previously worn and have only very slight wear or minor marks. CLARKS PRIVO Plum Suede Leather Mary Jane Sneakers Shoes size US 9.5 M. Athletic-inspired CLARKS PRIVO shoe in black suede leather with patent trim. Features an elastic cross strap, removable cushioned footbed and traction outsole. • Leather/man made upper • Tagged US Women’s size 9 1/2 M (medium width) • Insole length (measured inner heel to toe): 9 ¾ inches • Heel height: ¾ inches Condition: very good, minor scuffs on right toe(see pic). Elastic strap. Cushioned foot bed. They are like new and so pretty! 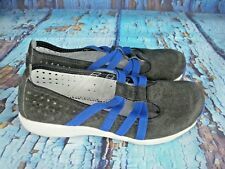 Columbia "Kacis" Contour Comfort Mary Jane woman's size 10.5 athletic flats have removable insoles, elastic ribboned vamp strap and grippy rubber soles. They show signs of light use, suede darkening and rubs, sole wear. lots of pictures so be sure to use the zoom and enlarge features so that you can truly see what they look like before purchasing. These are a pair of brown suede comfort shoes by Predictions. They are Mary Janes with an elastic cross piece making it easy to slip on or take off. They have a relatively low 1.25 modified wedge heel. Size 11B. New w/without the the box. I ship in1-3 days of payment. Please ask if you have any questions. SALVATORE FERRAGAMO Black Suede Top-stitched Cross-pattern Mary Jane Shoes Marked Size: 8.5 AA If you need any additional information, please feel free to email me. LADIES LAND'S END FUR LINED MARYJANES/SZ 8B/SUPER RUBBER/PREOWNED/NICE!! REALLY NICE PAIR OF MAGENTA SUEDE LAND'S END LADIES MARY JANES WITH FAUX FUR LINED- VERY COMFY- SIZE 8B- CHECK OUT THE GOOD PICS. Not very noticeable, does not affect function. Upper heel is extra padded. Removable insole is nicely cushioned. Designer/Label: Cole Haan. Style: Flats. Material: Suede. Color: Gray. Material:suede and elsastic stretch bands. Color: brown. GOOD CONDITION KANGAROOS SIZE 10 BARELY WORN. Dark Taupe (Beige) Suede Leather Upper with Smooth Brown Leather Accents. Style # J46404. Just a little bit about what we are. DK Plum/Bungee Cord (Brown) Suede and Smooth Leather Upper. Style # J46102. Being able to zoom in gives you a close up look that may not be visible to the naked eye. In excellent condition inside and out. Soles are in excellent shape as well. See photos for best description. Great overall condition and freshly cleaned. Small flaws on the suede as seen in photos. Welcome to Aurora's Closet! Our desire is that you receive a fresh, refurbished or new item. Your satisfaction is important to us. These garments have been carefully curated and most have been steamed for freshness. Certain garments are purposefully distressed and don't reflect lack of care. We always aim to please the customer, so please message us with any questions or offers. We aim to ship same day with a 2pm (AK time) cutoff. Kalso Earth shoes. Negative heel. Brown leather and brown suede. Slip on with elastic band. In good used condition. Please see pics for exact condition. Skechers 49405 Womens Bikers-Get-up Mary Jane Flat- Choose SZ/Color. 5 out of 5 stars - Skechers 49405 Womens Bikers-Get-up Mary Jane Flat- Choose SZ/Color. 1 product rating1 product ratings - Skechers 49405 Womens Bikers-Get-up Mary Jane Flat- Choose SZ/Color.